Raising My Twins | It's what's on my mind. I’m not the first to attempt this. Google “homemade graham crackers” and you will get many versions, some claiming that you need to look no further…so-and-so has got it all figured out. Well, in my humble opinion…they have not. Shockingly, every version I saw online starts with butter, and a lot of it! (*Buzzer noise*) No way. Graham crackers would never have butter. Sorry, gourmands…peddle your moist, rich cookies elsewhere. 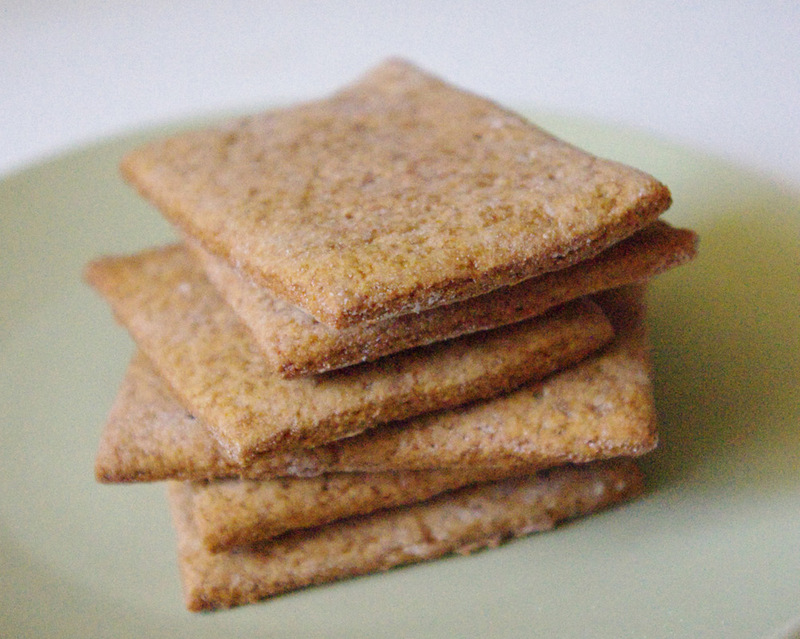 Graham crackers’ signature feature is their dry crispness. Round One. Aren’t these gorgeous? Yep…far too good to be considered graham crackers. Having just enough baking theory under my belt to be dangerous (but probably woefully inept), I did something I’ve dreamed of doing: I consulted the box of Organic Erewhon graham crackers and wrote down the ingredients as a starting point to my own concoction. They were: wheat flour (which means white ’cause it’s not “whole”), whole wheat graham flour, dried cane syrup, vegetable oils (safflower or sunflower), honey, molasses, leavening (baking soda, ammonium bicarbonate), sea salt, cream of tartar. These differ only slightly from the box of Honey Grahams everyone has in their cupboard. I compiled dry and wet ingredients separately, using all whole wheat flour—half regular whole wheat, and half whole wheat pastry flour. They are made from different types of wheat. The regular whole wheat flour is as close to graham flour (more coarsely milled) as I could get with organic ingredients, and it turns out to be just fine. I chose coconut oil and guessing high at 1/2 cup (for 2 cups of flour). I used regular sugar and only a tiny bit of molasses due to an earlier experiment which told me too much molasses can change the personality of a cookie quickly. Knowing that I wanted these to aerate as much as possible to get crispy, and noting that the boxed crackers used ammonium bicarbonate, a.k.a. hartshorn, I investigated getting some of that, but thought that the irritating ammonia gases produced during baking might not be something I’d want in the house with the girls. 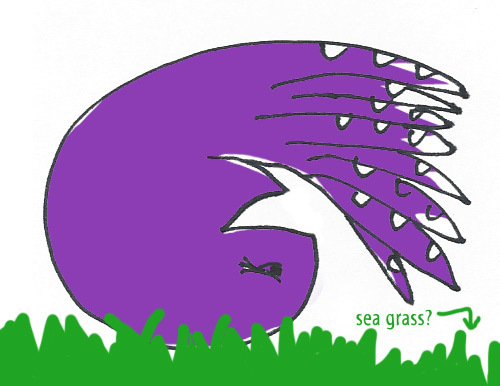 I haven’t totally ruled it out though for future experimenting. I could bake with it while they are napping, perhaps. Hartshorn is apparently still the leavening of choice for certain crispy European and Scandinavian cookies, but is harder to find here in the U.S. I ended up adding a significant amount of water to the dough to mix it well. The dough was greasy (I knew I had too much oil to begin with!) but rolled out nicely and produced delicious cookies with a graham-crackery flavor, but of course way too moist and cookie-like! Round Two. 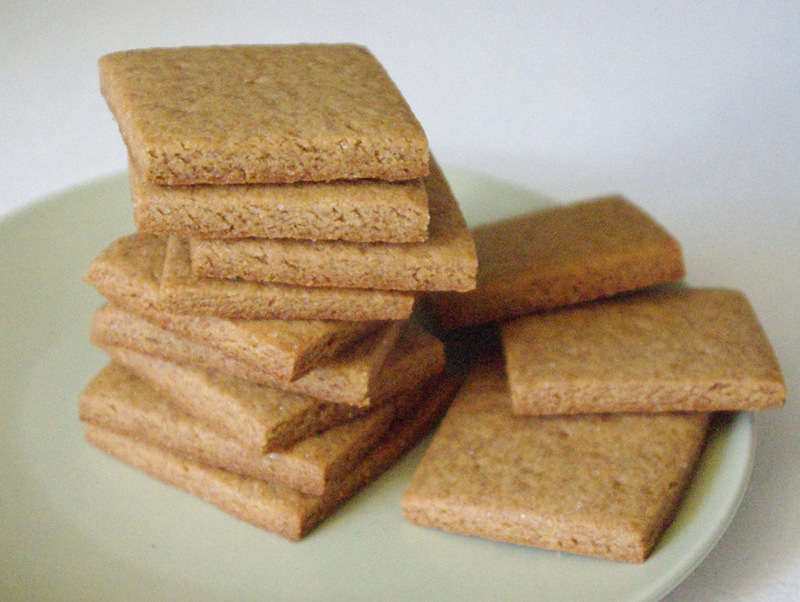 Not as photogenic but they are far closer to real graham crackers in flavor and texture. Second round I subbed in brown sugar for the white sugar + molasses, as the original molasses amount (1/2 teaspoon) was so scant anyway, it’s actually hard to measure less. I changed the leavenings, reduced the oil to 3 tablespoons and increased water to 1/2 cup. I rolled them thinner, reduced the oven temp and the results were much closer: even more authentic graham cracker flavor, but still too moist and/or chewy, depending on oven time. Still working on it! As of July 2016, this post was a draft laying around for years now. Thought I’d throw it up there, but sorry…don’t have the final recipe yet. We’ve decided that The Otter, with her sunshiny disposition and perfect manners, has a dark side. While driving up I-5 toward home recently, she looked out her window at the night and said, “These trees will lead us to our darkest fears.” I honestly think a chill went down Dad’s spine. I burst into laughter, loving her spookiness. Days later she was drawing a tall building with many windows. She showed it to me after she’d added bodies jumping or perhaps falling from the top. I looked at the falling bodies and several lying on the ground beside the building and said “Wow!” just as she ran off with the picture saying, “Ooh! I need a red crayon to draw the blood!”. She’s not wrong. Do we have a philosopher on our hands? Or just a realist? 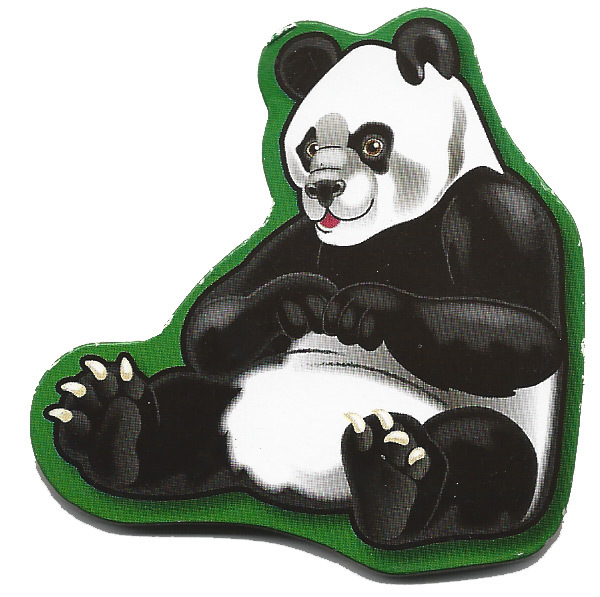 Rachel is stubborn by nature (PC way to say it: strong-willed) and she’s also somewhat introverted and she gets scared in new environments. And because she has speech delay—she has difficulty with both comprehension and expression—she doesn’t understand as much as other 4-year-olds, and when she doesn’t understand, she never indicates that, she just appears to be ignoring you. Without her twin, she is a lot less outgoing, and she’ll retreat into this recalcitrant place more often. She wants to participate in things. She just doesn’t know how to get herself there, because of this confluence of factors. And even when her sister is present, Rachel can be more focused on Audrey than on following instructions. Her old school had a psychologist visit the classrooms periodically, and this woman appreciated Rachel’s nature and helped her teachers understand more about Rachel. She also helped me with ideas on how to approach and reassure Rachel. She’s not a “difficult child”. Well…actually she is, but she’s not flawed. She’s just made in such a way as to be challenging to adults’ sense of control, and that’s a big deal. Thing is, beyond comprehension, beyond introversion, she is also very independent-minded, and she will not be pushed around for no reason. This will serve her well when she’s older, but for now, I’m struggling with the best way to guide her, to nurture that independent spirit while instilling some sense of the importance of participation. If a person takes an interest in Rachel, touching her gently on the shoulder and speaking gently and directly to her, that person gets a response from Rachel (a lesson learned the hard way by this mommy). I told one of the new school’s workers this today, in the hopes that she will care enough to try, but the response I got was not encouraging. I was there for a little bit while everyone dropped their kids off, and it looks like most of the kids are enthusiastic, talkative and engaging. Lucky for them. Because those are the kids who will get special attention…here and elsewhere in the world. In her book Quiet: The Power of Introverts in a World That Won’t Stop Talking, author Susan Cain explains the American cultural bias towards extroversion, and in reading it, I recognized my child as belonging to the titular group. It was helpful to me to know, and I even realized that I’m at least 50% introverted myself. (That’s right: I’m neither 100% one way or the other—putting me in a probably large group that the book doesn’t necessarily acknowledge.) I relate strongly to much of the introverted folks, needing plenty of solo-time and quietude myself. People I know would not likely realize that I spend much of my rare solo time in total silence by choice, or that I’m stressed by many common situations, such as crowds. And I most definitely have always preferred one-on-one interactions. Which makes having twins with simultaneous needs extra challenging for me. But that’s a subject for another day. I can see the potential heartbreak of introversion with my 4-year-old as we begin the school years. It’s not JUST introversion in her case. It’s a little bundle of traits that aren’t well-appreciated…at least in children. Because the only thing everyone (including me at times) wants is compliance from children. It’s not really a great goal, and I’m going to have to do some serious pondering on how to best nurture and advocate for this lovely, sensitive child of mine…who doesn’t appear sensitive, by the way, just as I may not appear to have introverted tendencies to outsiders…she just looks stubborn. I’ll have to help people see past the “negative” traits to reveal the sweetness in her. If only I could find that one special teacher that she needs…every year for the next 13 years. See? Heartbreaking. I’m still learning exactly the right recipe for encouraging, motivating and teaching her myself, so it’s going to take time and mistakes, but I’m determined to do right by this special person. Our kids NEED preschool. It’s not a fun luxury item, like I thought it could be. (That was silly, yes!) They both have speech delay and preschool is a necessary addition to their lives. Doc says so. So does the speech therapist. But I didn’t need to learn about the speech delay to know they need preschool. They’re climbing the walls keeping to a toddler lifestyle here at home. They are 3 now, not 2. They can’t hang around home with the same old things to do without getting into mischief. And because they are mischievous and I am often too busy, things are going badly between us more often than I’d like. They need expansion! So we signed up. Audrey in a traditional classroom, Rachel in Montessori. Back when I was only thinking about the girls attending preschool it seemed like it would be a kind of break, but in reality it has simply added more stress. A LOT more stress. I already have homework. And they haven’t even started class. I have to buy several items, label all their clothes, print pictures, decorate a poster, make a meal plan. Then I have to find time to volunteer at least once a week in TWO classrooms, in order to make the 12 hours per classroom requirement for the semester. 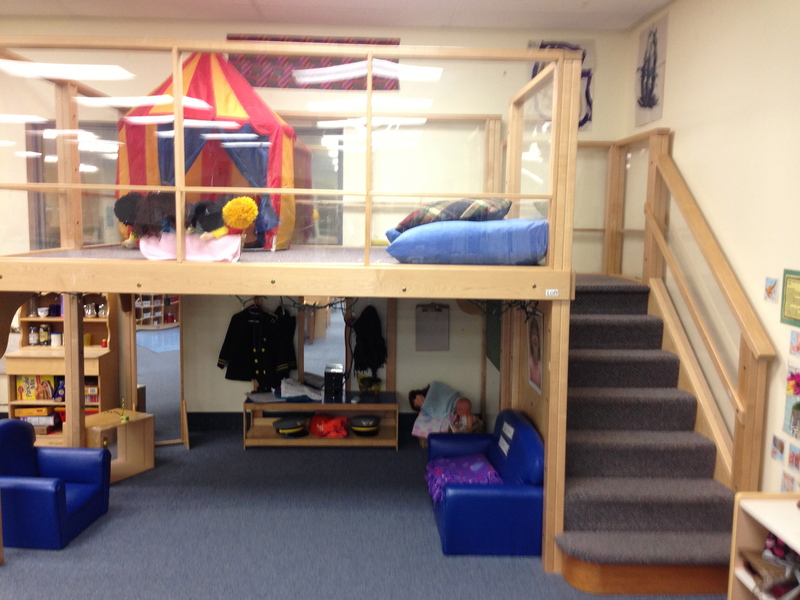 The square footage of each classroom might be larger than our house (in keeping with the payment). These pictures are from Audrey’s class. And did I mention the cost? Oh boy, the cost! Here’s an area in which having twins is really tough. 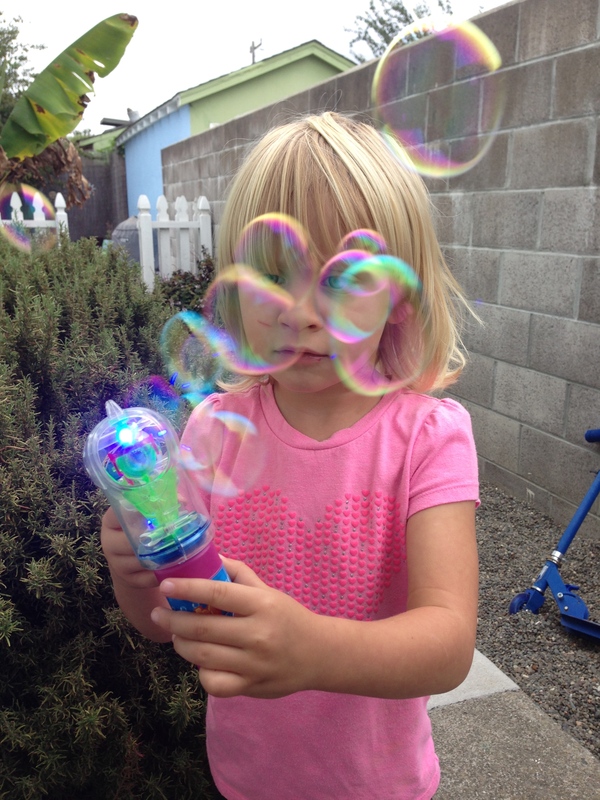 Our new monthly preschool bill is more than our mortgage! How’s that for messing with one’s budget? Have you ever suddenly added an expense that cost more than your housing?! And no, I didn’t pick an exclusive, fancy preschool. Not at all. It is a “lab school” at a community college where the kids have their regular, top-level teachers, and where college Child Development students also get their supervised “hours”. There is much observation of the kids here, and the programs are completely up-to-date with modern Child Development theory. (Did I mention I love it here?) Because of the lab format, the cost is actually quite a bit lower than average for the Bay Area. But there are two of them…two kids. Two classrooms, with different rules, and I have to volunteer for 12 hours in each. But I have to work to pay for preschool! Oh and they’re only there part time! Half days all week. I know I’m not the first one to face this problem…not by a long shot. But it’s very stressful. And if I stop sleeping, like I did last night (worrying) then everything else will go down the tubes. I know we will make it work. We always do. But I needed to vent, to relieve some pressure. I’ve just stopped typing and taken some down-time before consolidating my lists and with that done I already feel better. And most importantly, I’m SO excited for the girls to experience their new school. It looks so fun that it would make anyone want to be a kid again. When did preschool become so expensive? Or was it always so, and has just become more compulsory? What’s your experience with preschool? 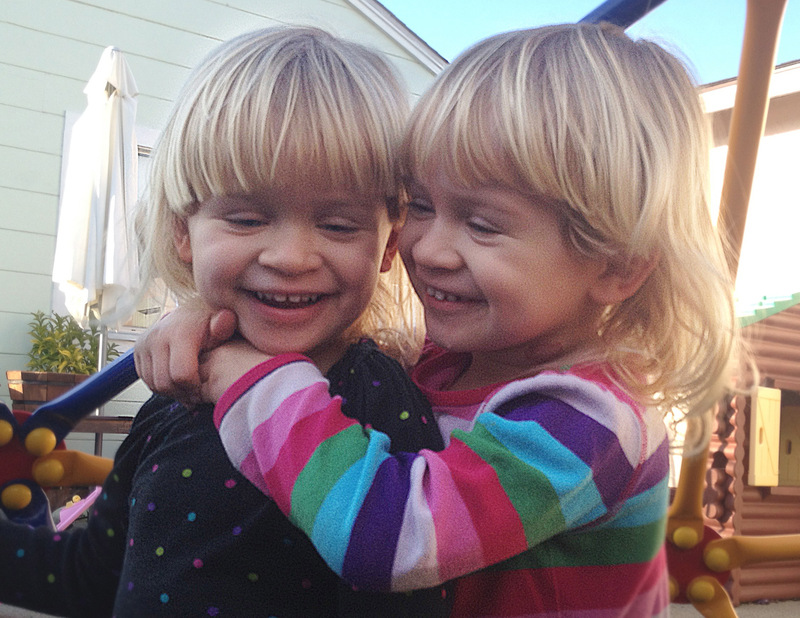 The girls have turned 3 and are as sweet as ever…and more challenging than before. It’s become important for me to spend lots of attentive time with them, which leaves me with less time for blogs and projects and cleaning (no tears shed for that). Next started a couple of weeks of pooping in her pants. She’d just refuse to go into the bathroom even though she was walking funny and stinking…and then she’d cry out “poo poo!” only as the lump was forming in her pants. Depressing? Infuriating? Oh yes. This mama was pretty beside herself. I was calm (inner defeat) for a couple of days and then I really spazzed out one time when she was pantsless and made a pile on the floor. And another. Well, my hitting the roof made the next days even worse…she was completely out of control. I remembered to react “not at all” and further, I sensed that she needed more positive attention from me, so I stopped trying to get things done and spent more time on the floor with both of the girls. This is challenging to navigate, because while I think paying extra attention to her in her extra-needy times is kinda sweet, I have to be careful not to alienate her twin sister in any way. So it takes an enormous amount of energy—mostly emotional. I have to be “on” all the time. I’ve been terrified during this time that sister would become affected by Ray’s potty issues. The Otter had recently come all the way to 100% trained—remaining dry overnight and graduating to undies at night—and felt like my “ace in the hole”. As long as she was doing so well, I could handle a lot more from Ray Ray. I mean, I’m half way done, right? But then it happened. Audrey stopped wiping herself, demanding that I do it. Then she had a couple of pee accidents while napping, and then she stopped using her little potty in the middle of the night even if she was already awake. Even if I asked her to go. So she had an overnight “accident” in bed. I flipped out at first (I try not to, but it happens) then I pulled it together and told her she was stuck with undies and she could do it. At night we split up the girls and coach them to near-sleep separately. I’m in charge of Audrey usually, and I’ve decided to use this time to really bond with her as it’s my only solo time with her all day. Just like her sister, when she feels very secure about her relationship with me, she tries really hard to do things that please me. So she was dry this morning. Sigh. Brow swipe. Interestingly, even though she pooped her pants yesterday, Rachel was also dry this morning (she wears a pull-up at night). So it’s either minor progress or extreme dehydration. But it made for a nice start to the day, so I’ll enjoy the optimistic feeling for now. I never learn. It’s been 8 months since our potty training start, by the way. I’ll just let that sink in. I believe in the importance of having some personal pursuits amidst my stay-at-home-momming. The reasons: a) making time for my own interests is part of leading a balanced life, b) I wanted to take up something (that costs less than golf) at which I can practice, practice, practice and become expert, and c) it’s very important to me to model both of these concepts for my girls. How I can keep my project handy but stashable. Can’t ignore the toddlers! Wanting to try something new, I recently I took up crochet. Turns out it’s really fun and rewarding. I can make things pretty quickly, and even design things myself—and I only started at Easter! I’m thrilled to be able to “put one in the win column” right away. I can already count crochet as a bona fide skill, and I can get better and try many more advanced techniques from here. There are great possibilities with crochet, including charity—another concept I want the girls to see in action. Many people crochet lap blankets for the infirm or beanies for preemie babies. I plan to donate some things in the future. Now, how do I crochet with two needy toddlers around? I put the yarn in my left pocket, the project in my right, and that way I can stash it to help the toddlers a dozen times an hour. Crafty! Below are some pictures of my projects—some are more primitive than others. I’m learning quickly! Flower potholders were a gift for the girls’ great grandma! The first hat I made. Baby sweaters and hats for a friend who just had her second set of twins! Tank top for Rachel. I learned a few things from this. It needs some fixing. I recently tried a technique called “tapestry crochet”, wherein a second color is carried along with the first and can be popped in seamlessly as you crochet. The girls are pretty lazy with their speech, I must admit. They do a bit of “twin language,” which although it seems to be a mystery to onlookers, is simply a mash-up of words and phrases they know with lots of gobbledygook thrown in. They do a lot of filling in with rapid sounds like “goota goota goot”, which sounds really fun. There is no indication that they’ve made up their own words for things, unless you count funky pronunciation. All toddlers are famous for cute mispronunciations. Here are some of our favorites from the girls. An octopus doing a somersault would be an applesauce doing an applesauce. Almost every 3-syllable word the girls know has turned into “applesauce”. They love applesauce. So they know “somersault” but now pronounce it “applesauce”. Then it gives them a hankering for applesauce. It’s all very clever. 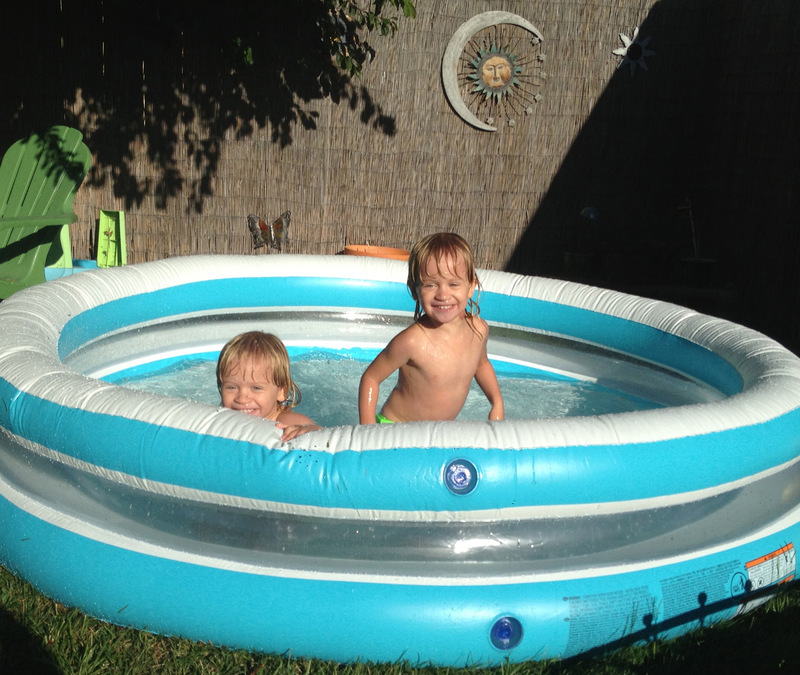 Potty Training Twins, Part Who Cares? I Mean Really, When Will It End? Audrey swears this guy is wearing a diaper. See? I’m not the only one obsessed. I know. Listen, nobody is more sick of my singular potty focus than me, trust me. But I must regale you with more torturous accounts of my pain. Because I’ve got little else. Singular. Focus. Actually, Christmas was problem-free at the Great Grandparents’, which was really a good thing. But this gave me a false sense of security. Again. When will I learn? When the holidays were over and we were back home, the girls started having accidents. Pee accidents, which was strange. We started cueing them again every couple of hours and the accidents stopped after a couple of days. Since then it’s been mostly great except: they almost never poop in the potty. They are withholding it again. Every day. So the pees are fine…Audrey especially is a champ with pees, telling me right away and hiking it to the bathroom to go. And Rachel will go when asked. But poop? They only go in the training pants they wear to sleep, or when they can no longer hold out, and then they put up a real fight. The last couple of days, Rachel has had numerous poop accidents. She tells me she has to go but then refuses to sit on a potty. She ends up pooping in her pants. One time Audrey cut in front of her at the potty (happens a lot) but Rachel was too late anyway. She was standing in front of it bent in half. More poop in the pants. The washer is constantly running. But today she really surprised me. She had to go, but I tried to let her take charge because, well…she won’t go if I try to persuade her. She would go into the bathroom, then back into her room to play with her sister. Eventually I heard the dreaded cries, “poo poo!” She had crawled into her travel/sleep tent and let it go in there! Ugh. Darling Rachel is going back to pants-free living here at home for awhile, so she can hopefully get a grasp of the basics over again. And I am eliminating training pants for both girls at nap time too. When I did this before the girls often stayed dry, but I slid back into using them daily and the girls have started actually using them too much. It’s amazing how much energy this has taken. I know that I missed our magic window, and along with other reasons, that’s why it’s been such a challenge. But I never thought I’d be halfway into our third month and having this many problems. Hopefully we’re about to turn a corner. Anyway, it’s still better to be here than before the beginning, you know? The other morning, at 9ish, Audrey came in to wake me after hubby finally heard them and got them up. I raced outside with 4 big donation bags for Disabled American Vets because they were coming through the neighborhood today. When Brian left for inspections about 40 minutes later, the bags were gone—except for the books—and there was no receipt on the door, which could only mean one thing: the tweakers nabbed our donation! Alfonso, our sweet neighbor confirmed that someone from “the tweak house”—the house across the street and to the left— lurched over and snaked ’em. This had me inordinately depressed because I had dug semi-deep for xmas—including lots of toys—and now I could only assume they’ll mostly get thrown out. A little while later I was in bathroom for literally one minute and when I came out the girls were on the rolling cart in the kitchen, reaching over the cutout in the wall. I took them down, then discovered they had completely crumpled up and torn one of their favorite books. When I looked up from the book I realized they had—from the rolling cart—hurled my lovely Xmas bouquet onto the carpet in the living room. This mama’s head was simmering pretty good now. 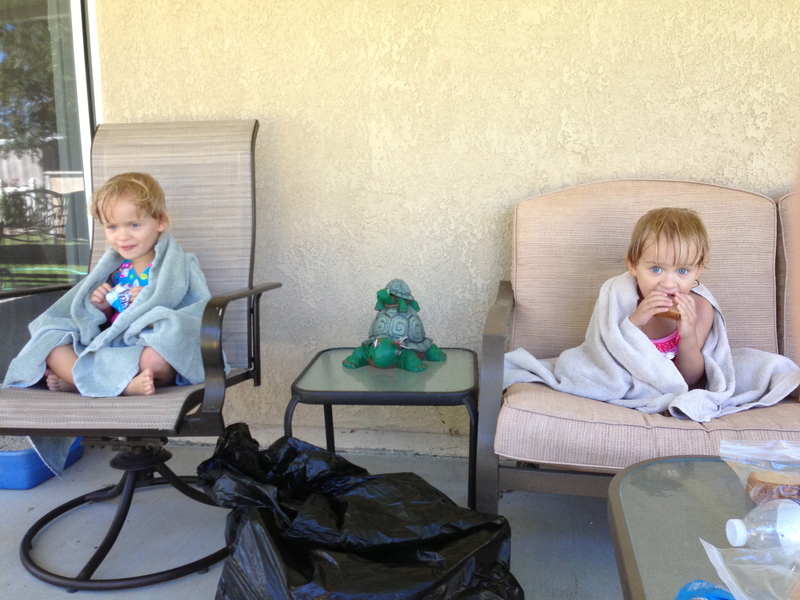 I locked them in their sleep tents to clean up without interference. No more than 30 seconds had passed before I heard Ray Ray yelling “Poo poo!” I rushed in to find she had made a softball-sized crapload in her pants. I got THAT half cleaned up—the flowers and water would have to wait—when there was a knock on the door. I answered in a flurry expecting UPS, instead finding a young man bearing holiday gifties from a vendor of our termite business! I apologized for my appearance and attitude (not mentioning the poopy smell surely emanating from me) and collected huge vats of goodies from him. I spent the next couple hours after girls went down for naps rapid-firing Danish butter cookies into my maw while trying to tackle some accounting. I will be sharing them with family next week, after I expand my waistline an inch!